No matter how much we roar our terrible roar and gnash our terrible teeth… he boarded his boat and sailed away. 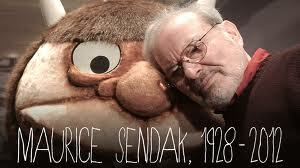 Maurice Sendak died on the 8th of May 2012 leaving us with a magical world that generations to come will discover and cherish in the way that many of us have done to date. Who knows how many millions upon millions of children and adults throughout the world can quote from Where the Wild Things Are. Why? Because Maurice Sendak let the children be who they really are; full of conflicts, rages, fears but also hope, trust and need for their own adventure. He did not moralize or judge them and as a result generations have loved him. His many talents and career were extensive and truly remarkable. He was an illustrator, writer, stage set and costume designer. His books, too numerous to list, have been adapted into movies, theater and even opera. He took the inspiration for his stories from his own life experiences, which had some very dark episodes. If you really want to understand and get to know this great man, treat yourself by watching this video. Meanwhile, as the evening comes I will sit down with my two year old son who has been calling all his stuffed animals Max. We will pull his favorite book out and we will watch Max sail in and out of the day, we will dance with monsters and we will be wild for a little bit … and I will not be the only one to say thank you to this special man who created one of my first reading memories. Now he is doing the same for my son and without a doubt one day for my grandchildren. If there is magic in this world he certainly created it. What Happened to the American Novel?